John started his career as a marketing manager for a welding wholesaler. It was whilst working here in the later 90’s that he developed his talent for working in IT. In 2004 he founded PC Docs to provide small business with a corporate level of IT support but without the associated costs. He likes a challenge and problem solving which lends itself to working in the IT sector. He mainly now works in new business development but can often be found on site installing servers and assisting his IT Engineers. 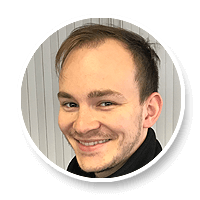 After joining PC Docs initially as an apprentice Danny has quickly gone onto lead the Help Desk and has become an integral part of the team. He came armed with an enthusiasm for the job and a thirst for learning. He has vast experience in solving quickly IT problems and can also be found on site installing equipment as he likes to keeps his skills sharpened as well as an opportunity to build relationships with our clients. Jack is the latest addition to PC Docs team. A great passion for IT is married with an excellent background of customer service will ensure that Jack will provide you with a continuation of the service you have become accustomed with from PC Docs. Mario started working in IT in 1997 for the Press Association UK and remained for over 16 years. He worked initially as a help desk technician and quickly rose through the ranks to lead the external IT event teams which was responsible for providing news feeds for news agencies. He managed events including, 2012 Olympics and the Royal Wedding of Prince William and the Duchess of Cambridge. He joined the PC Docs team at the end of 2012 as a networking and CCTV specialist and is Safe Contractor Approved. He enjoys the hands on experience of working on-site and communicating with clients. He has worked in IT for over 25 years and has excellent experience in networking. He works mainly in the back ground as our Exchange Engineer and looks after all our hosted server platforms. He also can be found on-site when we are working on our larger projects installing PC’s and servers and assisting the project management. The grease that keeps the cogs moving. She has been an invaluable member of PC Docs since its inception in 2004. She provides the all important logistics and administration that ensures we can run efficiently. With a back ground in Design she has been integral to the development of our literature and website. Ada Joined the PC Docs team in 2015 as an Accounts administrator and is currently sitting her final exams to become ACCA qualified. She ensures that PC Docs remains on a sound financial footing to enable us to provide our clients with an efficient service.